Key Lime cottage is a unique ground level Island home with a very private heated pool and patio with barbeque. It is very well located close to the beach and shopping yet very private! It is decorated to a high standard and very well equipped for all your vacation needs including high comfort beds (master bed with high quality hybrid coil sprung memory foam mattress). High speed wireless broadband, Games, DVDs, bicycles, fishing poles, etc. The free form pool is heated and provides for a relaxing and enjoyable vacation in an amazing unspoilt island retreat! We had many very happy family vacations on Anna Maria Island before deciding to purchase this delightful cottage. Once we saw the pool and landscaping area it was an easy decission. We work in the property and fashion industry and have been married for over 30 years. Our twins are big AMI fans too of course and we live in Northern Ireland. This cottage is our own Vacation property so we have furnished and equipped it to a very high standard with cool decor and original art. Comfort and relaxation is priority for ourselves and guests! Very well located close to shops, restaurants and it's a 5 minutes walk to a beautiful beach. Bicycles, buggy for beach gear, games and selection of books for guests use along with free Wifi and free pool heat in winter months. Bathroom 1 - Bathroom with bath/shower over, wc, vanity and basin cupboard, mirror shaver point. throughout the property and cei;ing fams too to keep you very comfortable night and day. yes , via air con. full fresh linens for beds. fresh clean towels for washing , shiwering and bathing as well as Beach are provided. Tastefully decorated living area with sleeper sofa, arm chair, coffee table, 42" LCD flat screen TV, Cable TV package, DVD, games, DVDs, Wireless broadband Internet, phone, dining area, french doors to private pool. Air-con and heat throughout. really well equipped utensil and dining sets for indoor and out. Kitchen - fully fitted with granite tops. Large fridge/freezer with ice/water dispenser. Dishwasher, waste disposal. Oven, hob, microwave, coffee maker, juicer, toaster, English tea kettle etc. There is a golf club on Anna Maria Island and several within 30 minutes drive. Freeform heated pool wet deck and integral umbrella stand - so you can lounge in the pool chairs while cooking your feet! Sooo relaxing! Outside: Outside heated shower, dining area, sun loungers, gas barbecue. Beach chairs, beach trolley, umbrella. You are also free to use the owners bicycles (two adult) and fishing poles. Utility Room: Washing machine/tumble dryer. Cleaning / Towels / Linen / Maid service: Towels, bedlinen and beach towels are all provided. Bonnie, thank you so much for your amazing review. You were truly wonderful guests and a real pleasure to communicate with throughout. Thank you for looking after our cottage so perfectly during your stay! Come back soon! I would highly recommend you to all other homeowners as great guests. Review. Delighted you had a great time. Absolutely loved your cottage on Anna Maria Island. Comfortable, clean and updated. The pool area is like it's own oasis. We spent every afternoon in the pool. The pool is well maintained and the pool area was clean. Rob's review of the island's restaurants was spot on. That in itself saved us a lot of time and energy looking for the right place to dine. The fact that St Armand's Circle is only 17 easy miles away thrilled my wife. The free trolley around the island is a definite plus. If the cottage were available more we would vacation on Anna Maria Island more. Thanks Rob. Many thanks for the fantastic review. So glad you loved the cottage and AMI. Thanks for being such wonderful guests. Lovely, well equiped cottage in a fantastic location on beautiful Anna Maria Island. Pool was amazing and great to have the use of bikes too. The most beautiful white sandy beaches are under 10 minutes gentle stroll away where you can watch the dolphins, play, walk, gather shells and watch amazing sunsets across the gulf of Mexico. One hour from Tampa Airport. Two hours from Orlando International Airport and surrounding Disney parks. Anna Maria Island is linked to mainland Florida via two bridges and is easily accessible by car. Tampa Airport approx 1 hour. Sarasota Airport approx 35 minutes. African Theme Park Sarasota 30 minutes. Disney and Sea World 2 hrs 15 minutes. Ringling Musem of Art 30 minutes. st Armands circle 25 minutes. Golf, 15 minutes numerous courses. Sarasota and Malls 30 minutes. The Bird man and Mote Aquarium, 12 minutes. Short walk to shops and restaurants. Free trolley service stops 1 min from cottage to more shops, restaurants, library, marina and beaches. Booking Notes: A £200 deposit is required at time of booking. All other monies to be paid 90 days before vacation date. No refund due to cancellation within 90 days. Booking is secured on receipt of deposit. In the unlikely event that the Owner requires to cancel a booking due to unforseen circumstances, all rental fees and charges will be returned. Notes on prices: Prices are for the property per week in UK Pounds. Monthly rates are available on request. A refundable security/damage deposit of £200 is required at the time of booking. A standard cleaning fee of £100 will be applied for normal cleaning of the cottage on your departure. 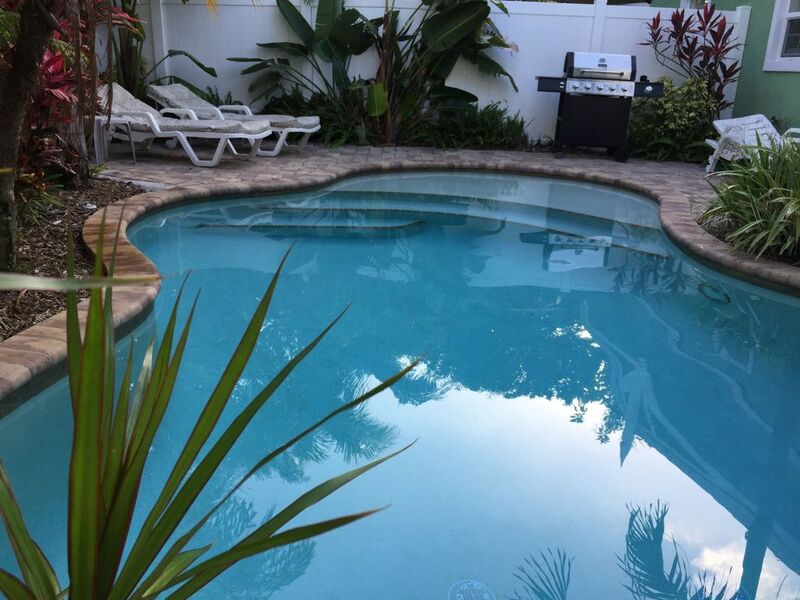 Prices quoted include USA taxes of 11.5% and there is no additional charge for pool heat during winter months.